IDR & ISDR models have been discontinued. As a possible substitute, please check out the CS Series or DRST Series for details. 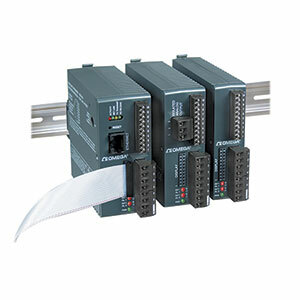 The OMEGA™ iDR DIN rail iSeries is a family of microprocessor-based instruments offered in 3 sizes. The instruments have a similar setup and configuration menu and method of operation, which is a tremendous time saver for integration of a large system. The iDR instruments offer a broad selection of signal inputs. The choices are easily selected from the remote programmer menu with 4 front-panel pushbuttons, or by serial or Ethernet communications. The iDR handles 10 common types of thermocouple, multiple RTDs and several process (DC) voltage and current ranges. This model also features built-in excitation, 24 Vdc @ 25 mA. With its wide choice of signal inputs, this model is an excellent choice for measuring or controlling temperature with a thermocouple, RTD, or 4 to 20 mA transmitter. The strain and process instruments (iSDR models) measure inputs from load cells, pressure transducers, and most any strain gage sensor as well as process voltage and current ranges. The iS has built-in 5 or 10 Vdc excitation for bridge transducers, 5 Vdc @ 40 mA or 10 Vdc @ 60 mA (any excitation voltage between 5 and 24 Vdc is available by special order). This model supports 4- and 6-wire bridge communications, ratiometric measurements. The iSDR features fast and easy “in process” calibration/ scaling of the signal inputs to any engineering units. This model also features 10-point linearization which allows the user to linearize the signal input from extremely nonlinear transducers of all kinds. The iDR offers either simple manual on/off operation or full autotune PID control (selectable preset tune, adaptive tune, PID, PI, PD control modes). The dual control outputs can be configured for a variety of independent control and alarm applications, such as heat/heat, heat/cool, heat/alarm, cool/cool, cool/alarm, or alarm/alarm. The ramp-to-setpoint feature allows the user to define the rate of rise to setpoint, minimizing thermal shock to the load is during start-up. For those who only need simplified menus and no PID control, a limit alarm (-AL) option is available. Users have a choice of 2 control or alarm outputs in almost any combination: solid state relays (SSRs) form “C” SPDT relays and pulsed 10 Vdc output for use with an external SSR. The optional analog output can be programmed within a range of 0 to 10 Vdc or 0 to 20 mA. It is selectable as either a control output or as a calibrated retransmission of the process value—a unique feature among controllers. The remote programmer/display can be programmed to change color at any setpoint or alarm point. For example, the instrument can be programmed to display the process value in GREEN during warm-up, in AMBER to signal the normal operating range, and in RED to signal an alarm condition. Embedded Web Server option allows you to connect directly to an Ethernet network and transmit data in standard TCP/IP packets, or serve Web pages over a LAN or the Internet. With the serial communication option, the user can select from the pushbutton menu between RS232, RS422, and RS485, with straightforward ASCII commands or MODBUS. RS232/RS422/RS485/MODBUS: Selectable from menu; both ASCII and MODBUS protocol selectable from menu. Programmable 300 to 19.2K baud; complete programmable setup capability; program to transmit current display, alarm status, min/max, actual measured input value and status. Line Voltage/Power: 90 to 240 Vac ±10%, 50 to 400 Hz*, 110 to 375 Vdc, equivalent voltage. No CE compliance above 60 Hz. Low-Voltage/Power Option: 24 Vac**; 12 to 36 Vdc; 20 to 36 Vdc for Ethernet and isolated analog output from qualified safety approved source ** Units can be powered safely with 24 Vac power, but no certification for CE/UL is claimed. 1. "-DC", "-C24" or "-C4EIT" not available with excitation. 2. Analog output (option 5) is not available with "-AL" units. 3. Ethernet options are not available for the iDRA controller. 4. "iDRA0*-AL": 1 analog retransmission and 1 alarm. 5. 20 to 36 Vdc for "-C4EIT" and "-EIT"